Avatar: The Last Airbender: "Bato Of The Water Tribe"/"The Deserter"
"Bato Of The Water Tribe"/"The Deserter" / "Bato Of The Water Tribe"/"The Deserter"
"Bato Of The Water Tribe"/"The Deserter"
I had remembered Bato Of The Water Tribe as a lesser episode, and it is certainly the lesser of the two this week, but it’s nevertheless full of great dialogue and it features an excellent fight sequence. The plot revolves around the discovery of the titular character, one Bato, a Southern Water Tribe warrior and friend of Katara and Sokka’s father. Katara and Sokka are thrilled by this unexpected reminder of the creature comforts of their home (such as the horrid-sounding stewed sea prunes), as well as the connection to their father, but Aang feels uncharacteristically excluded. In the meantime, Zuko and Iroh employ a bounty hunter who uses her mole-monster to hunt down Katara and, by proxy, Aang. All of this culminates in a fantastic fight scene where the Aang Gang, naturally, triumphs by working together. The brilliance is, of course, in the details. First, the discovery of Bato is preceded by a scene where Sokka shows considerable tracking skill in describing a battle between the Fire Nation and the Water Tribe. Aang’s discovery of a sword made from a whale tooth is a rich little detail, as well. Sokka remembers himself as a boy of 13 (although he looks younger in his memory) trying to join his father’s war party only to be told that he needs to stay and protect his sister. This must have been shortly after their mother was killed, although the details about that are yet to come. Another great detail to notice: when Bato appears, Sokka is only chest-high to him. Remember this when we see Bato again. On the other side, a bounty hunter named June and her shirshu, the aforementioned eyeless mole-monster, appear on Zuko’s ship and rip a hole in the deck to retrieve the stupidest stowaway ever (Because really? An Earth Nation fugitive hiding out on a Fire Nation ship? Man, that’s suicide). June is gorgeous, sarcastic, and can obviously handle herself. Iroh, that old horndog, is smitten. This would be a little creepy in real life, but in cartoon form, I’ll forgive Iroh about anything. Let’s pause here for a few quotes. Now we get to the lousy aspect of the episode, which was written by first-timer Ian Wilcox. They pull out the classic situation-comedy where someone overhears part of a conversation and then jumps to a conclusion. In this case, while you're probably expecting Jack Tripper from the set-up, it is our intrepid hero Aang, who is feeling excluded when he overhears Katara and Sokka talking about how much they’d like to go see their father. He misses the moment where they affirm that their primary mission is to get Aang to the North Pole. Rather than hilarity ensuing, Aang goes off to sulk by himself and is handed, out of nowhere, the McGuffin, excuse me, a map showing how to find S. & K.’s dad. Instead of handing it over to Bato, he wads it up and stuffs it in his pocket. I guess I can see this sort of selfish behavior from Aang the 12-year-old, but it’s hard to make it jibe with Aang the easygoing and somewhat enlightened Avatar. I don’t have a problem with a character being written as complex enough to act in contradictory ways. In fact, it’s safe to say that I always prefer it. In this case, however, it doesn’t make sense that it would take Aang so long to realize how selfish that he is being. The episode keeps smacking Aang (and the viewer) with this realization, and by the second or third time, I started covering my now-tender nose. The dialogue is great and the characterizations are generally top-notch, but this Aang is a few steps out of line from the Aang we know. Let’s get back to the quotable quotes. Bato arranges for Sokka to undertake the ritual of ice dodging, in which Water Tribe boys race a ship through dangerous waters and become Water Tribe men. There’s no ice at this spot but plenty of huge rocks sticking out of the water for Sokka to dodge. Although he winds up using the benders in his crew to get through the final part of the test, Sokka succeeds. Bato marks Sokka’s forehead with the mark of the wise, mentioning that it is the same mark that his father earned. Katara receives the mark of the brave. Aang gets the mark of the trusted, making him an honorary member of the Southern Water Tribe, but he finally figures out that he has to confess to hiding the map. Katara and Sokka are disgusted and make plans to leave Aang for their father’s rendezvous point. As an adult, I find it hard to believe that not only would Bato fail to intervene, but that the mysterious nuns (Who or what do they worship? Unclear!) would be so cold to the little Avatar. A few plot-heavy details later, the episode offers a wonderful fight sequence that includes the first one-on-one battle between Zuko and Aang since the second episode. June and her shirshu are wild cards in this, but it would be wrong not to mention Appa’s role and his struggle against the paralysis that the shirshu can inflict with its tongue. There’s no way I can go through this blow-by-blow, but of special note are 1) Aang’s held pose after blasting Zuko with water from the well, while the water falls like rain about him, followed by Zuko crashing to the ground; 2) Iroh stealing perfume, presumably for June (the horndog! ); 3) Sokka regaining feeling just before debris falls on him; 4) Sokka’s plan to confuse the shirshu with perfume and Katara’s subsequent perfume-bending; and 5) Iroh’s feigned paralysis because June has fallen on top of him (that horndog!). While I dislike the hacky premise behind Aang’s deception, I love the continued creativity of the action here and the little human moments that make it meaningful and fun. I’m happy I don’t have to grade this one. As much fun as Bato Of The Water Tribe is, The Deserter gets downright meta with an extended Apocalypse Now homage. We open with Zuko stuck in Saigon, imagining helicopters while getting drunk and smashing a mirror. No, no, I kid. It’s not that literal of an homage. 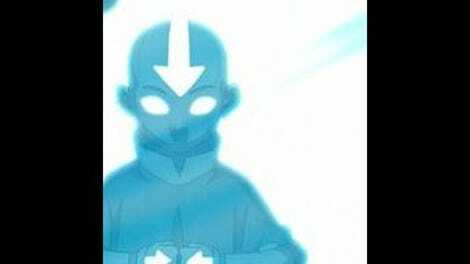 We open with the Aang Gang finding a wanted poster of Aang, along with one of the Blue Spirit and one of a guy with a double scar over his right eye. We close in on that one for extra significance (incidentally, this one is also written by a first-timer, Tim Hedrick, but directed by Lauren MacMillan, who is Avatar’s storyboard ninja). The poster board mentions a festival that is happening in a nearby Fire Nation town. 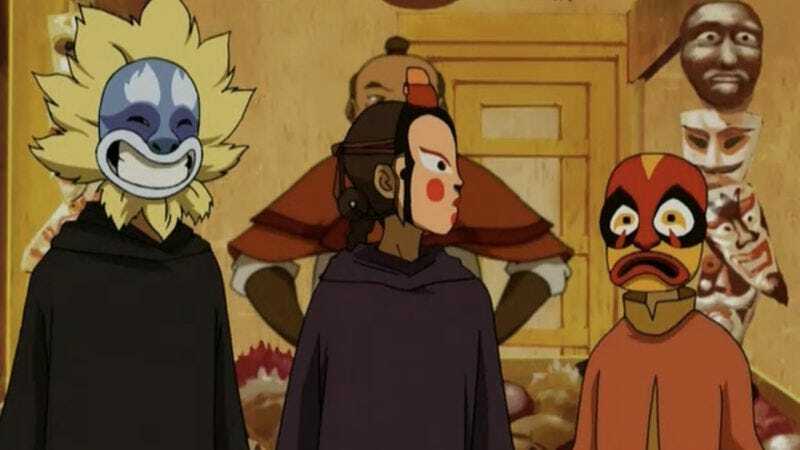 Aang wants to go see firebending up close, so the Gang disguises themselves with cloaks, then with masks. The scene where Katara switches the masks between Aang and Sokka is hilarious. At the festival, the Gang takes in both a puppet show in which Fire Lord Ozai fries an earthbender, and then a firebending display. Aang’s ill-conceived concern for Katara leads to him revealing himself to be the Avatar before the crowd, only to be saved by a mysterious stranger. Well, sort of saved. Appa does the heavy lifting. This mysterious stranger is one Chey, who was, incidentally, the fourth image on the wanted poster board. Sokka somehow marks him as a Fire Nation soldier (How? I don’t know), but Chey explains that he is a former soldier. He tells them that now he serves Jeong Jeong The Deserter, a formerly high-ranking Fire Nation officer (a general or admiral or something) who walked away from the job in disgust. Chey says, “He’s the first person ever to leave the army and live! I’m the second, but you don’t get to be a legend for that. That’s ok, though.” Ha! Chey talks about Jeong Jeong’s genius and points out that some people call him mad. Chey doesn’t sound too stable himself. Too bad they couldn’t get Dennis Hopper to play this guy, but the actor is quite Hopperesque. Meanwhile, Zhao is on the scene questioning the officials in the town, and he is unconcerned about how low the local crime rate is. He has his men prepare the river boats. They are going upriver to find an Avatar and perhaps a former high-ranking Fire Nation officer who has gone native. This is where the Apocalypse Now/Heart of Darkness comparison doesn’t work. The Marlow/Willard character should be a stooge of sorts, but neither Zhao nor Aang are that. Nor is Jeong Jeong a man who has gone savage, although he does like to talk about savagery. I’m getting ahead of myself, and even though the analogy doesn’t quite work, the execution is fun, so let’s continue. Accompanied by Jeong Jeong’s troops (dressed in native-style straw and rags [native of what, I don’t know, but that’s the vibe]), the Aang Gang arrives in Jeong Jeong’s camp. J.J. doesn’t want to see them, but he does call Chey into his tent for some harsh, but unheard, words. When Chey rejoins the Gang, he tells them that J.J. doesn’t want to talk with Aang. Aang will not take no, however, and he marches into J.J.’s tent and demands that J.J. teach him firebending. Jeong Jeong is, of course, the double-scarred man from the wanted poster earlier. He is voiced by Keone Young, who is best known to Deadwood fans as Mr. Wu. To him I say, and I mean this with utmost respect: hang dai, cocksucker. Jeong Jeong compares Aang to a fish in the river who cannot image the ocean as a way of telling Aang that he is not ready to learn firebending. Aang persists. J.J. tells him that he must first learn discipline itself and then waterbending and earthbending before he will be ready for fire. His description of the Avatar cycle is rather impressive. Water is cool and soothing. Earth is steady and stable. Fire, though, is alive. It breathes and grows. Without a bender, rock will not throw itself, but fire will grow and destroy on its own. After this, Jeong Jeong has vision of Avatar Roku, who commands him to teach Aang. In (spoiler-y) context, I’m not sure why Roku bothered, but I suppose he has a lot of time for this sort of thing. Cut to firebending training. J.J. has Aang squat in a wide stance on a rock over a pool of water and concentrate. It’s not as scatological as it sounds. Aang is overeager to start burning things, but J.J. points to Sokka, fishing idyllically on a nearby rock, and says, “Even that oaf knows to concentrate on what he is doing.” (Sokka: “Hey!”) J.J. takes Aang to a high rocky peak and has him practice his breathing. The power in firebending comes from the breath, he tells Aang. Aang must learn to master breath control. J.J. leaves him, but Aang returns to his hut before too long. “I’ve been breathing for hours!” Aang protests. “You want to stop breathing?,” asks J.J., not unreasonably. J.J. is annoyed with Aang’s lack of discipline and tells him about a student he once had who was interested on in power but had no self-control. Cut to Zhao riding up the river on his three boats. As in Apocalypse Now, native-dressed minions hurl spears at the man on the boat, and Zhao returns intense fire. Aang finally makes a small fire, but he tries to do too much too fast, and he accidentally burns Katara. Sokka’s protectiveness towards Katara extends to him knocking Aang down and yelling at the smaller boy for being uncareful. Katara discovers that she can heal her hands with water. Jeong Jeong comes upon her and talks about how much he wishes that he could do what she does. Fire is a terrible burden, he says, as he is forced to walk a razor’s edge between humanity and savagery. Zhao arrives and accuses Jeong Jeong of becoming a simple savage, to which J.J. replies that is Zhao who has embraced savagery. I admit that J.J.’s hair does look a little unkempt compared to most of the meticulous people of the Fire Nation. With a little smile, J.J. disappears in a ball of flame, leaving Aang to face Zhao alone. Zhao attacks with his usual ferocity and reveals himself to be Jeong Jeong’s former student. No self-control, says Aang to himself, finally understanding . He goads Zhao into attacking him while jumping from boat to boat. After dodging a final attack, Aang tells Zhao, “You’ve lost this battle.” “Are you crazy?,” asks Zhao, “You haven’t thrown a single blow!” “No,” says Aang, “but you have.” He gestures to Zhao’s three boats, all engulfed in flames. Aang dives off the boat, and in the most direct Apocalypse Now moment, rises head-first from muddy water. Mister Jeong Jeong, he gone, leaving behind poor clueless Chey. Cut to an extreme close-up of Zhao’s face as his ships burn. I suppose Jeong Jeong is lucky that this homage did not get too literal, or he’d be little more than a sacrifical cow on the altar of Jim Morrison's mommy issues. As I mentioned before, this homage to Apocalypse Now (and, by proxy, Heart of Darkness) doesn’t really work because Jeong Jeong hasn’t actually become a savage commanding his own forces and acting in parallel interest with the Fire Nation military. And while Zhao might be a savage who represents a savage military (because part of the point is that Marlow/Willard and the forces they represent are just as savage as they believe Kurtz to be, right? ), he’s not actually tracking Jeong Jeong with any intent to terminate J.J.’s command with prejudice extreme or not, but the Avatar instead. So the homage is supercool because Apocalypse Now is a tremendous cultural touchstone and it’s funny to have references to it in a show aimed at children, but I don’t know that it adds anything to the story. It’s borrowed cool, a little nod to the movie-literate adults who watch the show, but without adding any significance to the story, it’s a somewhat empty joke. At least they cut out the scene from the director’s cut where the Aang Gang spends seven hours of screen time having dinner at a French plantation. I hope readers understand that while I didn’t get anything out of the homage, I still enjoyed it on a visceral level. It may not have worked but it was a bold experiment, and that, I honor. No Stray Observations this week, sorry. I reined ‘em all in.